Aerial photograph showing Clachnaharry Lock and Lock Keeper's House Digital image of A 36844. Description Aerial photograph showing Clachnaharry Lock and Lock Keeper's House Digital image of A 36844. Scope and Content Aerial view, Clachnaharry Sea Lock, Caledonian Canal, Inverness, Highland, from west-north-west This aerial view from the west-north-west shows Clachnaharry Sea Lock Basin with the sea lock (foreground) which was built between 1810 and 1811. Two protective breakwaters which can also be used for mooring boats waiting to enter the basin extend from the tip of the embankments. The two-storeyed building beside this lock is the lock-keeper's cottage. In the background there is a swing bridge, built for the Highland Railway, and a lock which is at the entrance to Muirtown Basin. The northern end of the Caledonian Canal is at Inverness, but unfortunately the soft mud on the shores around this point meant that it would be very difficult to construct a sea lock for access to the canal. The best way for the canal to reach the deep water of the Beauly Firth, about 365m away from the shore, was to construct two large parallel embankments with bases built from quarry waste. The basin could then be formed in the space between. The Caledonian Canal was designed by Thomas Telford (1757-1834) and built between 1803 and 1822 at a cost of £840,000. It was the first example of a transport network funded by the government in Great Britain. The 96.5km-long canal provides a route for boats travelling between the North Sea and Atlantic Ocean as it runs from the Beauly Firth at Clachnaharry, Inverness, to Loch Linnhe at Corpach. Only 35.4km of this length is man-made while the other 61km runs through four lochs: Loch Dochfour, Loch Ness, Loch Oich and Loch Lochy. Unfortunately at 4.2m deep the canal was too small for most sea-going ships which led to it being altered and deepened between 1844 and 1847. Source: RCAHMS contribution to SCRAN. 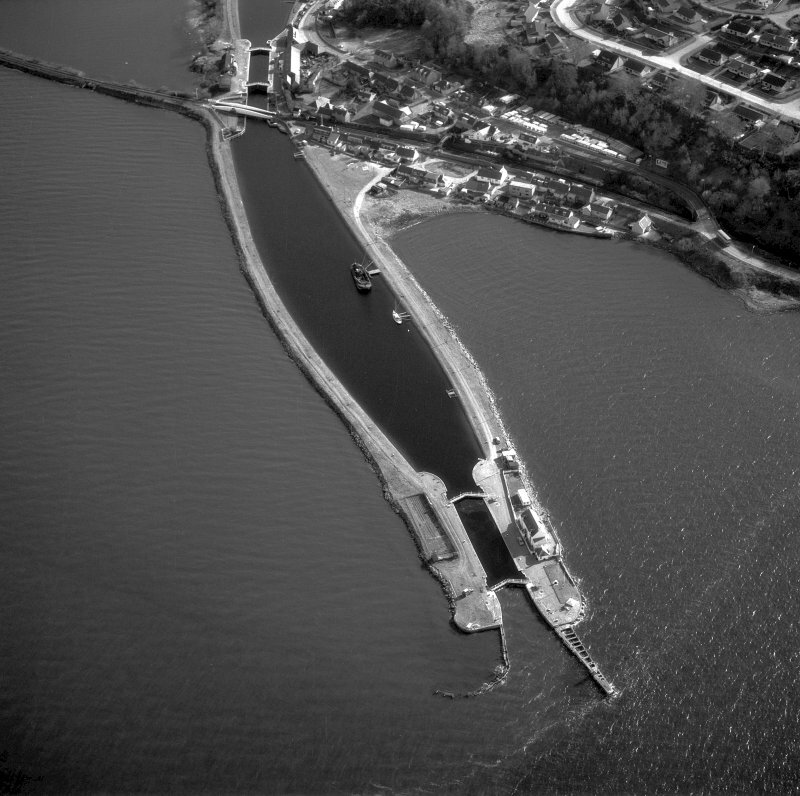 >> Item Level (SC 799647) Aerial photograph showing Clachnaharry Lock and Lock Keeper's House Digital image of A 36844.